Уникальный бумажник. Card-In-Wallet. Все действие разворачивается в кармане зрителя !!! "I received my new Horwitz Wallet today and although I haven't read all the routines I can already see the potential. It amazes me to think there are still wallets out there that are this cool and different to the tons of wallets I already own - It's wonderful quality too. Thanks so much for having these remade. They are worth every penny - I look forward to finding the time to really work on this and hope to get a routine together for my Christmas holiday season - Thanks also for the super fast service." "Hi Martin: two words - absolutely bloody awsome! - okay, thats three! Heres a few more: Thanks so much for the Horwitz Wallet, I'm gonna have some fun with one of those routines..."
"I have killed 12 people so far with the Horwitz Wallet and I am not in jail. I am going to kill even more!!!!" 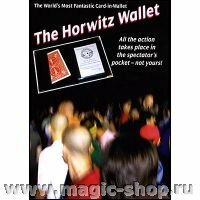 "I bought the Horwitz books six months ago and discovered his fantastic magic. As a professional magician doing Mentalism, I love and use Mr. Horwitz's routines... just gold! So I'm really looking forward to discovering the wallet." "The Basil Horwitz Psychic Pickpocket effect is one of the most brilliant routines I can imagine."